I have been thinking for the past few years that the amount of pesticides, herbicides and other toxic chemicals in food is getting out of control. Genetically modified foods, mass enterprise farming and the demise of the small family farm all over the world makes me sad. I read an article last year that mentioned how vegetables grown in 2010 had half the nutrients that they did 50 or 100 years ago. No one seems to have time for dinner at home anymore and increasing numbers of families worldwide are eating in fast food restaurants. Obesity is on the rise, cancer is on the rise, mental illness and hormonal imbalances are screwing up families all over the world. What is going on? Have we lost touch with what is important in the pursuit of progress, bigger TV’s and fatter wallets? Eating healthy and wholesome food that is nutritious and tastes great is important to me. As a parent of three very young kids, it is extremely important that I give my kids the types of fuel their brains and little bodies need to keep them healthy and give them the best shot for success in life. So, with the options in grocery stores getting more and more toxic, generic in flavour and lower and lower in nutritional value, it seems obvious to me that something had to change. I have always been curious about organic food. More and more over time I started to do some research on this and felt it pretty important to adopt more of this into our family lifestyle. Going organic is more of a lifestyle change than just a decision we make. Buying everything organic sounds great in principle, but once you get over the sticker shock, you realize that it is kind of impractical given the fact that not everything is available as Organic, and the corresponding enormous jump in your grocery bill when you factor in all the elements in your shopping cart. So, then it makes sense to balance out with some good choices to get what you need while minimizing your exposure to toxic intake. Buy organic the ten top things that are most obvious to avoid otherwise—the stuff that has the most toxic footprint (there is a top ten list or two out there) on the human body. Buy from local farmers (that do not put nasty chemicals and fertizers in their soil) where possible. Go to your local farmer’s market or take a drive in the country if that is easy for you. 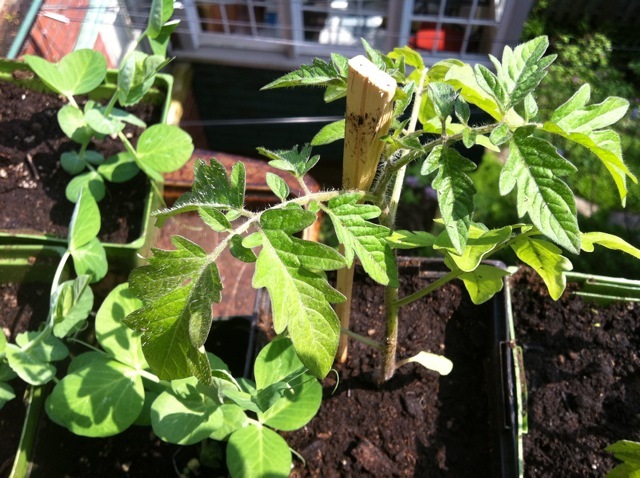 Grow some of your own vegetables (for those of us with a back yard or a sun drenched balcony). It s not that hard, and you would be amazed what you can learn in a pinch. So it was that this year I decided to take the plunge into Urban Farming and attempt to grow some of my own organic vegetables in my back yard. It has been about two months since I started, and I put in a lot of hours into research, spent many a back breaking hour converting some of my yard into a vegetable patch, and have learned a lot. Success is still a ways away, some time towards the end of summer when I can really begin to harvest many of the crops that I have planted, but there have been some small wins and a few setbacks. All in all, I have been having a great time with it, but the story is just beginning to unfold. I will my Urban Farming experience with you here, beginning today. I took this challenge on this year, with no expctations other than I was going to give Organic Farming a try and see what happens. I have never been a green thumb. If anything, I was more of a plant killer than a grower. I have never intentionally killed a live plant, but most plants entrusted in my care do not seem to survive the long haul. This, I hope to change. I started with one of those seeding kits you get from the garden centre (plastic tray and a bunch of expanding growers medium (Peat Pucks)) and a bunch of Organic seeds that I purchased online from the Salt Spring Seed Company on Vancouver Island. I had a lot of questions and Dan Jason was really very helpful and super nice to do business with. I felt like my rookie season was in good hands and there was nothing he could not help me with. I wanted this to be an experience I shared with my kids—a great way to teach them about where food comes from (other than the grocery store). From seed, to the garden, to their plate is a much healthier and more sustainable path than the one we normally take. It is easy for them to dis Daddy’s dinner when they have no idea where it comes from. 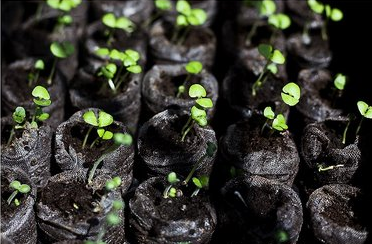 Starting out is not that complicated or difficult, just takes a good variety of seeds, some potting soil or cheap and cheerful a seed starter kit and some pots. You’ll need some time on your hands for a little bit (or a lot) of online research if you are like me and have never grown anything intentionally before. The rest is up to mother nature and it really is a miracle. 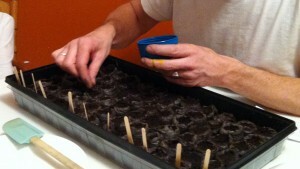 So one day in late April, one by one, each of my kids and I spent an evening planting 1, 2 or 3 seeds into each of the little pucks in a little plastic greenhouse tray that held 72 in all, watering them, covering them and stuffing them under the bed. Each had their own technique, and I tried not to get too worked up when they spilled seeds all over the floor or planted them too deep. All in all, the seeding was pretty painless. We planted Spinach, Kale, Arugula, Cucumber, Squash, Broccoli, Summer Peas, beans, two kinds of heirloom cherry tomatoes, Sweet Yellow Peppers, Carrots, Basil, Summer Savoury, Cilantro and a bunch of fancy lettuces. We watered, we covered and we waited. Every morning we would get down on our knees, slide out the tray and see if anything had happened the night before. It took a few days, and a lot of anxious anticipation, but on the fourth day, surprise! Out poked a few little sprouts. Life!! We had given birth to a bunch of beautiful little seedlings. It was so exciting that we could not contain ourselves. By the end of the second week, we were very pleased to be staring down every day at about 100 little sprouts working their way up through the soil. We carefully set them out in the light, not far from the window, watered them every day or two, and constantly checked in on their progress. As the spring was moving along, we were anxious to get going on the planting part. There was no rush though, every day it was raining buckets outside and there was no break in sight. We learned the hard way not to rush things. Earlier, we planted three kinds of potatoes right into the yard that all failed miserably. I was so sad about this, because all of the research I did said that Organic potatoes were so incredibly delicious and super easy to grow. Promptly after I planted four or five rows of these fantastic heirloom seed potatoes, it rained cats and dogs for days and days. By time the sun came out, and the soil had a chance to dry, the potato seedlings had rotted right in the ground. I guess maybe it just was not meant to be this year. I will definitely try again next year. Once the sprouts start to grow with their first set of real leaves, it is time to weed out the strong from the weak, separate the men from the boys so to speak, and plant the strongest plants into pots of their own, into organic potting soil. This is where you see the fruits of your labour begin to take shape. While not every seed turned into a plant, and some of the plants were kind of lame relative to some of the others, on the upside, I ended up watching about 100 seeds transform into well over 6o beautiful potted plants which I am proud to say, have all been planted in the ground by now and are doing just great. I have had a few setbacks, but all in all, things are growing just fine. I will talk more about the successes and failures in successive posts throughout the summer. In my next post, I want to go over getting your planting beds ready. If you are like me, your back yard was not ready to just plant vegetables into. There is a lot of research to do and a lot of preparation to get everything ready if you want to do it right. It is a lot of work, but in the long run, success will be a lot sweeter at harvest time. What you do this year, will continue to give back year after year if you decide to carry on with your Urban Organic Farm. I am definitely looking forward to reaping the harvest. Thinking about giving organic gardening a try? It is not too late to get started. If this sounds like something you would like to give a go, then order some seeds today—you could be growing a green thumb by next week. If you have started your own back yard Organic Garden, and have some success stories and or disastrous tales of failure to share, please post them here. We all can learn from what you have learned and then it will not have been for naught. For better or for worse, we are definitely looking forward to hearing from you. If you have any questions, please do not hesitate to post them here as a comment or @HeadsUp_Dad on Twitter. Next post: Toxic Chemicals in personal skin care products?